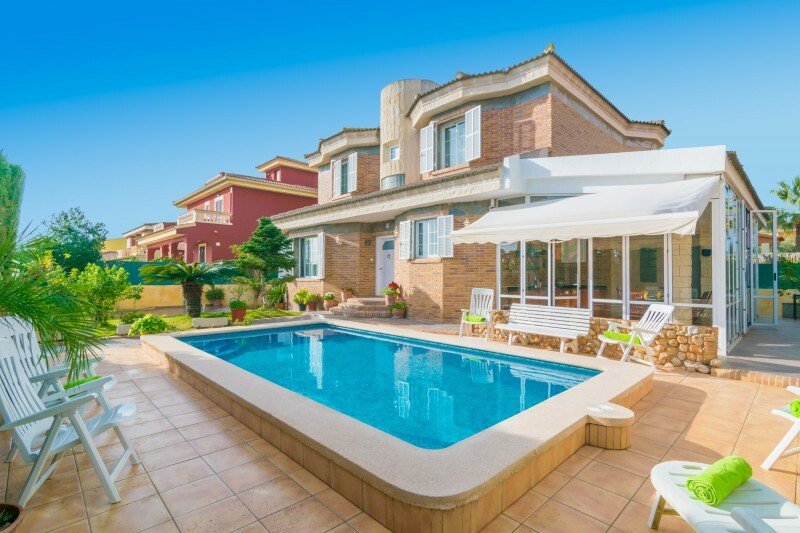 Fantastic chalet with private pool, located in the residential area of Pont d'Inca, only 6 km away from Palma de Mallorca and with capacity for 10 people. This chalet with private pool is located in a quiet and family environment, so perfect for big families in search of peace. After sunbathing for a while on one of the 10 available sunloungers, you will enjoy your swimming in the chlorine pool as ever. It sizes 4.9 x 3 metres and has a water depth of 1.5 metres. There is an exterior shower in case you want to wash off quickly. After a long and entertained day, you can enjoy a barbecue at the beautiful furnished porch or the table with chairs at the terrace. Remember that there are neighbours around so please do not disturb during rest hours. Inside, you will be welcomed by a classic living-dining room featuring sofas, TV-Sat, AC and a large dining table. If you fancy cooking, the kitchen is very well equipped with ceramic hob, oven, a lot of space to cook excellent recipes and a table with chairs in case you prefer to enjoy your meals in here. The utility room offers a washing machine, a tumble dryer, an iron and an ironing board. There are two bathrooms with a shower each in the house, one still on the main floor and the other on the top floor. And, in order to rest, you have 5 bedrooms, all of them with closet and AC. Four of the bedrooms have double bed and the last one has twin beds. One is on the ground floor and the rest are upstairs. We can prepare a cot and a high chair if you are travelling with your baby. Finally, the house is equipped with oil central heating for the winter season. Pont d'Inca is the perfect destiny to stay in a quite place but still near the capital. You can easily reach Palma by train or car in about 10 minutes. The island's capital is famous for its cathedral La Seu, the Bellver Castle and its picturesque old town and its beautiful patios. The is a huge variety of museums, art galleries, shops, restaurants, bars and other nightlife. The nearest beaches are Can Pastilla and Cala Major. Beautiful villa & the locals we met were very friendly. 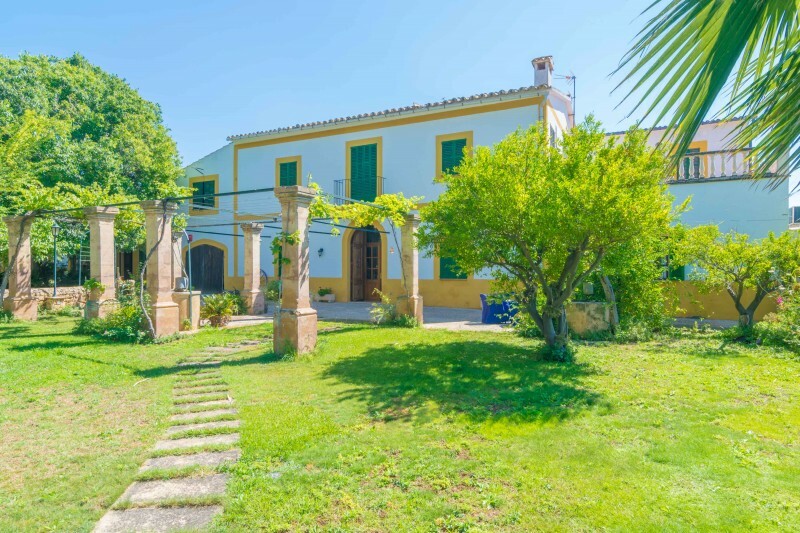 - The only slight negative about the location was the distance to Palma Central (which was stunning by the way) I would recommend hiring a car. We often got taxis to Palma which would cost around 45 Euros return journey. Not at all a negative but this location is not a British Tourist place. As I said would be handy to hire a car for the drives to Palma Central/Arenol or even Santa Maria for the Sunday market. + Like a home from home. Very relaxing location and the beds were super comfy. Was also great to have the washing machine for use. Was also great to have free Wi-Fi. - The house was a little on the cold side, but that was more to do with the weather at the end of April! (And of course you can turn on the heating). There was some confusion about collecting the keys on arrival. I was told the day before arrival that the keys would be in the box at the gate but on arrival they were not there. I had to ring the contact, who then informed the host. The owner had actually been waiting for us to ring the bell. + The house was big, spacious and spotless. The owner was very friendly and welcoming. The beds were very comfortable. There are a couple of local restaurants and a local supermarket within walking distance which is very handy. - Var där i slutet av oktober. Kalla golv! Kall pool i skugga + Rymligt. Fräscht. Nära stort Supermarket. Mukavat omistajat. Hieno talo, hyvät ilmastoinnit.